Rarely does a CD come across my desk that on first listen I'm so stunned at its brilliance that I feel somehow clueless for not having heard of the artist previous to receiving it in the mail. 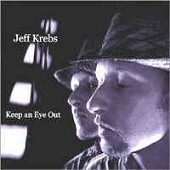 Such is the case with Jeff Krebs and his sophomore solo album, Keep an Eye Out, a stomp through lyrics worthy of Springsteen's best story telling masterpieces, dirt-under-the-nails country, slight bluegrass, and folk. Opening with masterful banjo, the title track has no problem instantly grabbing your attention and establishing this as an album that is going to draw you in throughout. Krebs' storytelling seems very autobiographical. His voice is warm and torn, rough-edged by life, but still smiling because he's able to tell his stories to all that will listen. The rollicking "Emily Take It Back" is bouncy and fun, complete with a rock piano intro, and a sing-along chorus hard to miss. However, as joyous as the melody is, the lyrics are melancholy, packed with sorrow as a relationship goes sour. Krebs, however, manages to get a big grin on your face as you sing along enjoying every minute of it. The darkness of "Up In The Old Hotel" will have you on the edge of your seat, as the song's melancholy folk melodies blend perfectly with Krebs' story of an old hotel that seems to attract the bad elements. The chilling reality and stark frankness of his songs, as he paints a vivid depiction of life in places the rest of society would just soon forget, brings a tear to your eye as he makes you see what he is singing about as clear as day. However, the music, walking a fine line between pop-tingled country songs and melancholy folk, always manage to lift your spirits, keeping things melodic enough to swallow, rather than breaking you down tale after tale. He takes you the edge but pulls back before making you jump. The faint Apache Boulevard shows Krebs at his best with just a guitar and his voice, stripping the song down, live on a 2-track, getting all the intimacy and purity he possesses. "Problem by the door," a flawless blend of pop and folk, further proves Krebs is one of the nation's most promising songwriting, delivering the same edge-of-your-seat songwriting and beauty whether he is flushing the songs out with a full band or keeping them simple.